Francis Rivera sketched Desert Bloom on location from the Guadalupe Overpass, overlooking the rail yards. 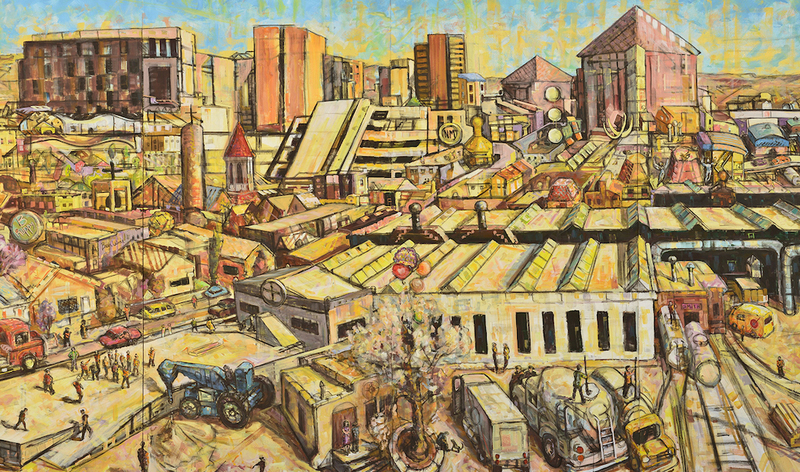 The panoramic view depicts the warehouses and tracks as the lifeblood of the community and integral to the city’s past and future prosperity, while the architecture of Albuquerque creates the basis for the piece by forming a jazz-like super-urban density that captures the noise of the city at its loudest. The high level of detail allows viewers to locate themselves and cultural landmarks within the community. Prominent streets such as Central, Broadway, and 4th Street are emphasized as vibrant cultural corridors that accentuate the nature of their communities. Rivera monumentalizes local institutions such as the Red Ball Cafe, St. Francis Xavier Church, the South Broadway Cultural Center, and Gertrude Zachary’s Castle. Painting his first mural in 1983, Francis Rivera was one of the two founding members of the original Albuquerque Muralist Coalition.